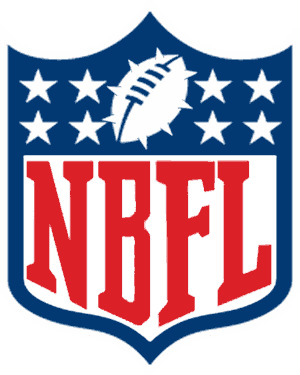 The NBFL season chatter thread can be found here. Make your predictions and slag off the also rans ruining everything for you. Schedule Each Round has a 7 day period. Scheduling PM your opponent and coordinate early. Even plan a week ahead if it helps. Forfeits If an effort is made by both coaches and it just doesn't work out you will be granted a forfeit tie. You get 2 per season. 3rd time counts as a loss for you but remains a tie for your counterpart. SPECIAL NOTE In relation to the section on forfeits, take note that forfeits will affect your draft position. You have been warned..
Fluff The NBFL has an exclusive rights deal with ESBN. If you wish to add to the colour of the league (And we encourage you to), please PM DrPoods or contact him on Discord. Tie Breakers If two or more teams end on the same points total at the end of a season, the tie is settled accordingly. 6th: Oh Cmon, really? D6 it. Commissioner's Note It's our league, we can shape it. Most ideas will be put to a vote if the relate to rules. If you have a fluffy idea lemme know and lets make it happen! - Each team is awarded at least one draft pick per season. - Draft pick order is determined by reverse order of previous season finish. - Expansion teams will be granted extra draft picks - 2 from the expansion draft board and 1 from the standard draft board. - Compensation draft picks will be awarded by JackassRampant based on some formula related to your current roster. - Compensation draft picks will be taken from the standard draft board. - Expansion teams can swap draft picks in the expansion draft. - You may cut any permanently injured player. - You may cut healthy players above 31 SPP. - You may request a skill change among any 1 skill player on your roster from anything to a normal access skill for the respective player. - You may add and subtract rerolls, cheerleaders and assistant coaches freely. - Any team may request funds. A PM thread will be set up for that purpose. Building is an integral part of the NBFL offseason. Please pay careful attention to these rules. - You will have three types of players on your team: Draft Picks, Undrafted Free Agents and Veteran players. - Draft picks will gain SPP that matches their draft profile. - Undrafted free agents can gain up to 6 spp with a few exceptions explained below. - Veteran players are player you carried over from the previous season. They are not eligible for any SPP from builders. - Assign to your draft picks and then lowest SPP players. - If you have run out of draft picks to assign MVPs to assign them to the lowest SPP players. - If you have a Legend level player on your team, assign MVPs to them if you have run out of Draft Picks. - If you run into a situation where your lowest SPP players are all 6 SPP, that is fine. It should not come to that point often. - In general, the point is to avoid giving players skills they haven't earned them. Builder games MUST wait until AFTER drafting is complete. There will be financial and RR penalties for teams that don't wait. Exceptions made rarely.